I haven’t had a big crash for years now, so I suppose it was coming. This time wasn’t as bad as my last, and I was able to walk off the hill and get home without a detour to A+E, so I suppose I should be grateful for small mercies. I have now been off the bike for over four weeks, though, and frankly I’m getting a bit bored. 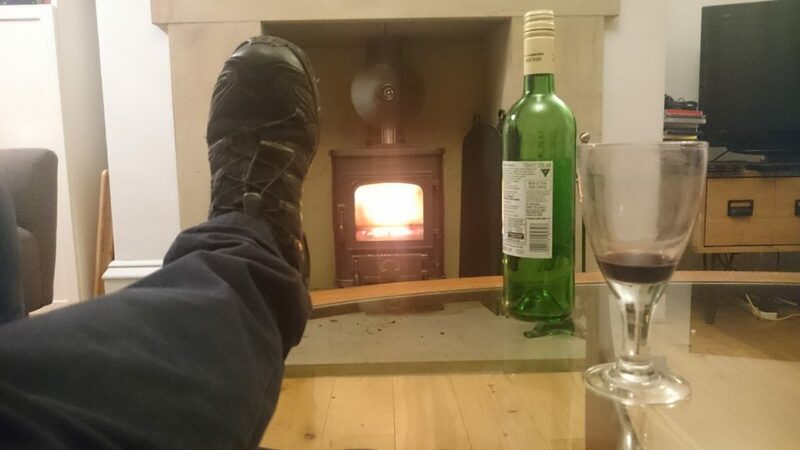 Much as I like vegetating with my feet up in front of the stove with a glass of wine, when you have to do it for a solid month because you can’t do much else it honestly starts to become a little frustrating. Most enduro stages have intermediate marshal points where the organisers station someone to keep an eye on the trickier parts of the course, and to sweep up crashed riders, broken bikes, body parts and whatnot. Stage two of the PMBA Grizedale Enduro had two marshal points, the first at an awkward rooty-rocky slippery corner section, which had caught me out in practice, but which I cleared pretty well in my race run. The second marshal point was at a rocky drop which I had barely even registered as I shot over it in practice. Under timed conditions, sadly, I took a different line, my front wheel washed out and I went down onto the rocks hard. My leg got twisted up under my bike and once I’d stopped sliding down the hill I knew my riding was done for some time. I couldn’t stand up, or bend my leg at all, and I tentatively pulled my pads off to survey the damage. Nothing appeared to be obviously snapped or sticking out, but I still couldn’t do anything much movement-wise, so the marshal called for the paramedics to assess things. A few minutes later, having prodded and poked me to ascertain that I wasn’t seriously broken, they hauled me to my feet and ordered me off the hill under my own steam (in the nicest possible way, I hasten to add, helping me with the tricky bits and making sure I didn’t pass out or anything). I limped slowly down to the bottom of the course, dodging flying riders, several of whom had the decency to bin it in the same spot as me, and made my way to the campsite, which I had fortuitously managed to crash about as close to as it was possible to get without leaving the race route. 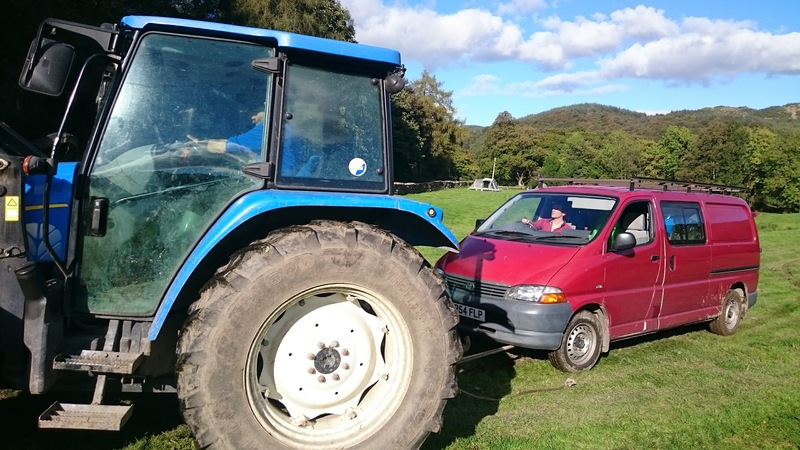 We packed up the van (well, Rik did, with me helping as best I was able) and once we’d got the farmer to tow us out of the field and driven the three hours or so home, that was the end of our weekend. Approximately a week after the crash I ended up in A+E for real with a suspected DVT related to the walloping my calf had taken from the rocks. This was really painful, like having six-inch nails hammered into my leg at times, but ultrasound revealed that any clot was far enough down my calf to not pose a serious risk, the doctors advised that I’d basically just strained everything about as far as possible without rupturing anything, and I was sent home with painkillers and told to take it easy. Since then I have managed to hobble slightly faster every day, and I can now turn the pedals on the turbo trainer on easy for maybe fifteen minutes or so, and I am walking almost like a normal mobile pedestrian again. I may even be able to ride a proper bike in the next few weeks, according to the physio I saw recently, provided I religiously practise all the prescribed exercises with which I’m now allowed to torture my lower leg. Fun fun fun.